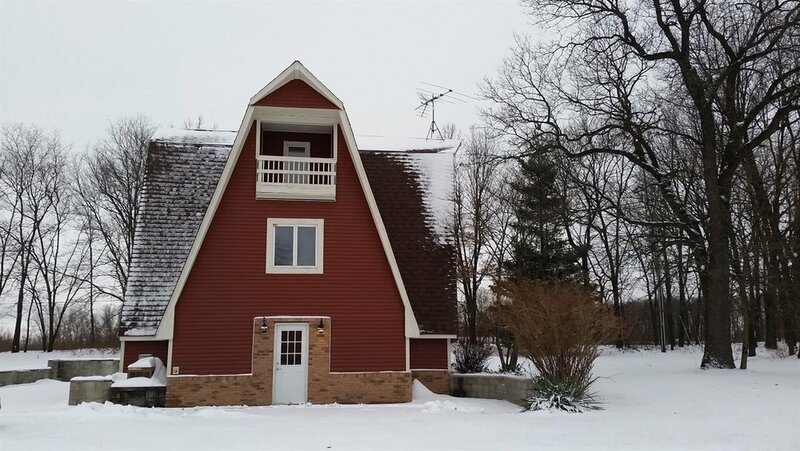 Have you ever seen an A-frame home? Have you ever had to arrange furniture in an A-frame home? Well, let me tell you, it’s not easy. An A-frame home to me is a modernized teepee. It is as it sounds, built in the shape of an A. They are tall, with steep roof lines peaking in the shape of a triangle. Some are built with a lot of windows, some without. These homes are growing in popularity. They can be quirky and quaint, or sleek and modern. I was asked to stage an A-frame home after being on the market for 43 days. This super FUN A-frame had a lot of nooks and crannies making it difficult to place furniture. Laura Eenigenburg with Re/Max was receiving the same feedback showing after showing. “We can’t imagine our furniture in this home.” Well, in walks me! So, on a staging consultation I walk around. I take pictures, measurements and this is where the house comes alive. Very similar to how my furniture pieces speak to me when I paint. I can envision a room completed even when empty. The right colors, style etc. all start to compile in my head, like a gear moving 1,000 miles per minute. Sometimes, it’s hard for the client to even keep up. Then, I get to work. I plan, buy, organize, beg, lol, and get my lifters and movers in place. Then, we stage. The biggest challenge in this home was the living room. The living room is the welcoming room when you walk in the front door. It’s an odd space with another odd space attached to it. So with an entry door, closet door, stair way, built-in book case, laundry room door, small wall space and a “hallway of sorts” to the master; it’s definitely an insurmountable task to envision furniture in the room. So, how do you overcome such an unimaginable space? You step back. You measure. You envision something new. What really helped with this space was that it was empty. Clean slate. Fresh start. I set out to design a space where you have a welcoming entryway, ample seating and still see the most important object in the room…the TV. As you can see, I placed an accent chair in front of the bookcase. Since most people don’t reach into their bookcases every day, I used the bookcase like it was a wall. Stack your books, décor or games on the shelf and use for storage. You can also, place blankets and baskets on the shelves as well. I also place a small table along the same wall for a place to set your keys, etc. 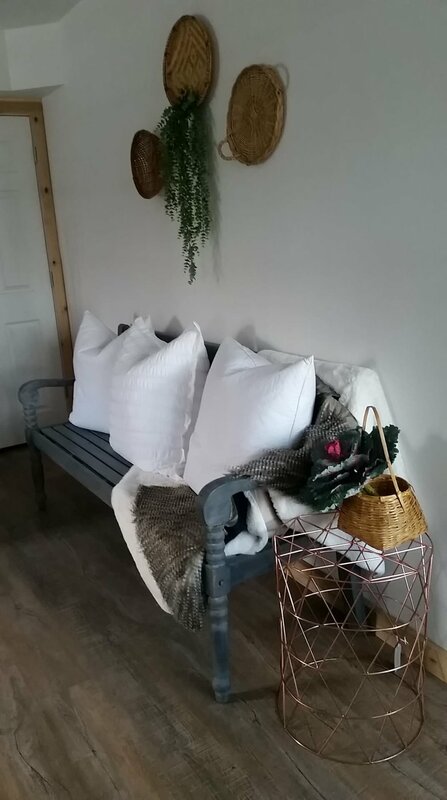 On the opposite side of the front door was a small wall before the closet door, so a simple repurposed gossip bench was placed here. A smaller sized “couch” (I design the couch here live) was placed on the main wall, creating a focal point in the room. Using vintage woven baskets as simple and affordable wall art draws the eye into the room. The TV wall has plenty of room for a large screen TV, but we needed to highlight that the space is large enough for a standard size couch. So a large bench and a chair were placed in this nook to showcase the space’s true size. The house had a few other challenges but the living room proved to be the largest one. Moving around the rest of the house, we spruced up the master with fresh linens and rugs. In the master bath we added a few serenity evoking elements to spark relaxation. Moving upstairs, we added a kitchen table and some more affordable wall art. Also, added cute towels and live plants to the quaint kitchen space. Finished off the extra bedrooms, added a few soft touches to the second bath and left the loft area mostly to the buyers’ imagination. 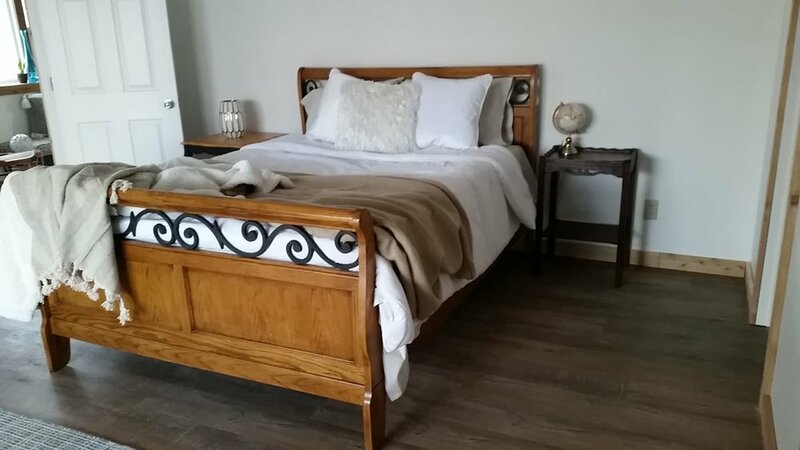 Keeping with the white walls and natural cedar trim, we created a charming, simple boho chic space. The home now feels warm, cozy and really gives the prospective buyers a vision of how they can live in this modern day teepee.